Burning Wood: Heaven. I'm In Power Pop Heaven. Heaven. I'm In Power Pop Heaven. Simply put, this is one the greatest power pop records EVER! 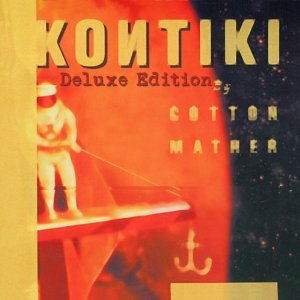 After serving some years in out-of-print prison, "Kontiki," by Austin's Cotton Mather gets a nice, lovingly priced, deluxe edition featuring a bonus disc of rarities. You can listen and swoon below. This is on the shopping list based solely on this cut, which you turned me on to a while back. Really one of the very best albums of the '90's! "is this some sort of reverie for a one-woman Jan&Dean headed for the crash?" .....one of my favorite song lines of all time. Fantastic tune. Will look this record up. Thanks, Sal. I heard of them but for some reason never checked them out, definitely up my alley. Nice. Thanks! Never heard that before, but I loved it! Thanks. And, call me nuts, but I hear the inspiration for "Girls in Their Summer Clothes" in that first verse. Thanks for the pure pop tip!! I have shelves of power pop, and this is probably the best indie power pop album I have ever encountered. The very rare record that actually is Beatle-esque without being just an imitation. I pre-ordered the deluxe edition from Amazon, and then on the way home yesterday I saw my local Newbury Comics had a copy of the deluxe edition on sale for $9.99. It was all a cheapskate like me could do not to buy it. So, now I am waiting for the mail. It is a great album, and I totally forgot until your post that I had it. Fun to revisit again. I remember what always struck me about it, aside from the quality of the songs was the eerie resemblance of the lead singer's voice to John Lennon's. Why did I not get the memo on this one at the time it first came out? Can't do anything but nod to the post and all the comments. It is a wonder of an album.